I have previously addressed a variety of brain imaging technologies useful in the diagnosis traumatic brain injury (TBI). Standard CT scans and MRI scans of the brain have significant limitations. Single photon emission computed tomography ( SPECT) can measure functional abnormalities of the brain by assessing cerebral blood flow. Standard studies take static pictures and do not necessarily correlate with brain function. There are now advanced 3-D images with detailed statistical analysis. There have been hundreds of medical studies published over the last 30 years related to TBI. In addition, there have been thousands of papers about (SPECT) in related brain disorders such as Alzheimer’s, PTSD, and Parkinson’s. As one might expect, the most severe abnormalities were detected in moderate and severe TBI. However, in patients with chronic neurological and neuropsychological symptoms, even with mild TBI, the SPECT is more sensitive and specific. Abnormalities of the frontal lobe are the most common. But the occipital lobe (the visual cortex) was abnormal in approximately 50% of scans demonstrating TBI. I again emphasize the relevance of visual findings in TBI. SPECT scans were particularly useful in situations where late-onset or psychological symptoms were not clearly related to the initial injury. As discussed, many patients do not know if they ever suffered a TBI, and if symptoms occur later, these patients are often dismissed as having just “psychological” findings. The SPECT may be THE key piece of diagnostic evidence showing a previous TBI injury. The goal of identifying patients with TBI is early intervention. SPECT can be used as a marker for improvement, improving blood flow over time (studies months or years apart) usually indicates clinical improvement. If a new drug is discovered that may improve the long term outcome of TBI patients, it would be very useful to have serial SPECT scans to help prove the drug is actually working. Imaging of the brain is obviously critical in making a correct neurologic diagnosis. The limitations of the immediate head CT in the emergency room have been previously described. SPECT is not a perfect tool but should be added to the arsenal of valuable tests to evaluate the TBI patients. 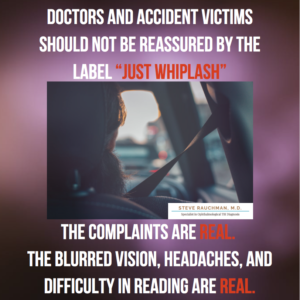 Not every TBI patient needs a brain scan, and not every TBI patient needs a SPECT. But this technology has proven value and is indicated in many clinical situations. No physician wants to miss an abnormal finding which may only be revealed by SPECT, no patient wants to quietly suffer when something is really wrong.